This section has been devised, to address the non-examination assessment or contextual challenge, for all GCSE examination boards. Follow the links below for all you will need on attempting the NEA. You may also find the Design Process section very useful. IT IS THE TEACHERS RESPONSIBILITY TO FOLLOW ALL REGULATIONS AND GUIDANCE FROM THE EXAMINATION BOARDS. THESE PRESENTATIONS / DOCUMENTS ARE MY INTERPRETATION. The appropriate examination board specification. FREE DOWNLOAD- FREE Sketch Easi Stencil (helps to make sketching and drawing in 3D easy) information / basic instructions and dxf file for a laser cutter. FREE DOWNLOAD - FREE Sketch Easi Again Stencil (Isometric, perspective and oblique, any angle, arcs, fillets, measuring and circles) information / basic instructions and dxf file for laser cutter. 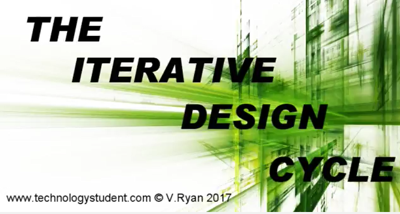 Click here for the Updated Video (June 2018)- "How to Deliver the Non-Examination Assessment"
The ITERATICE CYCLE DISK. A useful rotating disk, designed to help pupils utilise the iterative design process.